This book desperately wants to be a bad boy. His goal is to become a banned book in the library. He tries everything to win the librarian’s disapproval. Some of his tactics include using gross words, misspelled words, and made-up words. The book enlists readers to assist him by being loud and doing everything possible to annoy the librarian like flapping arms, wiggling and jumping up and down in their seats. To his dismay, the book makes its way into storytime. This book is filled with much humor, graphics, and simple illustrations. There are vivid colors, lots of variation in print size, alliteration, and onomatopoeia. 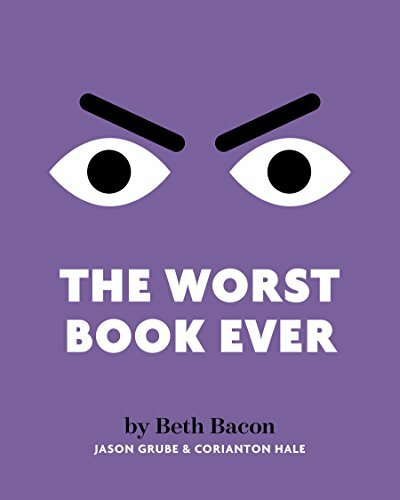 Bacon playfully encourages her readers to become accomplices in the book’s quest for notoriety. Bacon targets the book for a kindergarten through grade five audience. Beginning, intermediate and reluctant readers can join in the fun.